A Hitachi 3600 excavator and CAT 785 truck at Boonanarring. 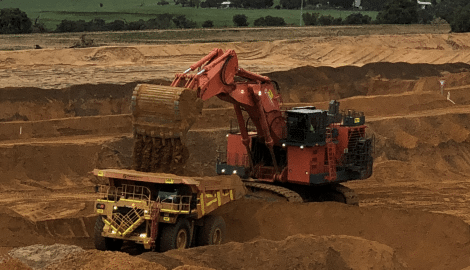 Image Resources has commenced production ramp-up at its Boonanarring mineral sands project in the North Perth Basin, Western Australia. 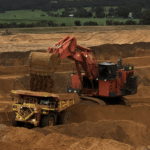 The announced ramp-up is intended to help the project towards its feasibility study (FS) target of 500 dry tonnes of ore per hour within the next six months. So far, Image has reported processing rates of 400 dry tonnes per hour for several 24-hour periods with no downtime. 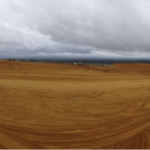 Image has worked quickly on moving Boonanarring towards first shipment; the project commenced construction in March this year and was fully funded by May thanks to a $50 million loan from Pala Investments and Castlelake. 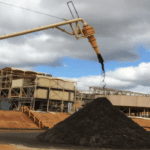 The company launched production at the $235 million project last month, achieving first heavy mineral concentrate (HMC) production on November 19. 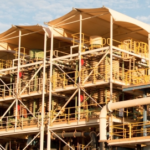 Boonanarring has now completed its wet commissioning phase and is preparing for its first concentrate shipment. Image is set to ship around 220,000 tonnes per year of HMC to China from Bunbury Port. The project’s valuation saw a 19 per cent increase in June this year on its initial pre-tax valuation of $197 million in response to rising zircon price forecasts. Boonanarring’s 2019 financial guidance and forecast production will be announced following budget approval by Image. The company expects to achieve positive cashflow by the end of the first quarter of 2019.